Designed for standard toilets, this elevated toilet seat bolts securely in place providing increased stability and safety. The included front cover is removable and snaps easily into place. This seat raises the height of the toilet by 3", it also uses a regular toilet seat and lid so it doesn't clash with the bathroom decorations. Made in the USA, this entire unit is made of durable, high quality plastic that will not rust or chip. It can safely support up to 600lbs. Raises seat height 3" above toilet bowl. Bolts onto toilet for increased stability and safety. 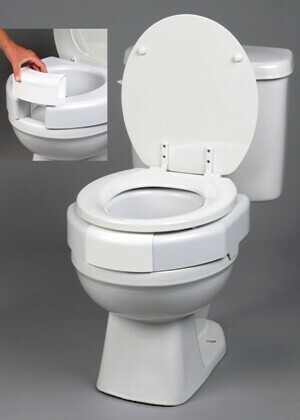 Installs using your current toilet seat and cover so it will not appreciably change the appearance of the toilet. Great for use in households with men! Installs easily, hardware kit included. Not for use with elongated toilet seats. Designed to fit most basic model Standard Size toilets. Not designed for elongated size toilets. Width of Front Opening: 4"